This week’s returning contributing writer, Jessica Ford, is a graduate fellow in paintings conservation at Winterthur/University of Delaware. She is fulfilling her third-year internship at the Smithsonian American Art Museum and after graduating this summer will begin a Mellon Fellowship at the Brooklyn Museum in the fall. My final year as a graduate student has been filled with modern and contemporary art, which is exactly what I was looking for when signing on for a third-year internship with the Lunder Conservation Center. As I encounter all kinds of artistic, commercial, and conservation materials, the questions of “what” and “why” become increasingly intriguing and complex, in part because they are often total mysteries. I usually find myself in one-sided conversation with paintings during long treatment hours together, asking questions that would be more effective if directed towards artists, were they still living. Surprisingly, these chats are not fruitless; rather, they build up a sense of responsibility to help document living artists’ thoughts for the benefit of future conservators, the artwork, and, ultimately, the viewers. Switching interview subjects from paintings to humans promised to be a daunting step towards unpredictability. To prepare for this challenge, I jumped on two fantastic opportunities that took place earlier this year. One was the Artist Interview Workshop hosted by VoCA and the Lunder Conservation Center, which provided two interactive days packed with interview tips, practical challenges and solutions, and equipment details shared by experienced interviewers. An excellent summary of highlights has already been written by fellow attendee Kristin Robinson, so suffice to say here that my notes from the experience are treasured. Additionally, Smithsonian Conservation Fellow and VoCA Program Committee member Steven O’Banion graciously let me assist with the interview of Robin Rose, a local artist whose work appears in the collections of both the Hirshhorn and the American Art Museum, as part of the Hirshhorn Museum’s artist interview program. Steven shared the background information he had gathered about Mr. Rose with me, and the day before the interview he familiarized me with the logistics of the plan. This was to be the Hirshhorn’s most elaborate interview yet, beginning at the artist’s home studio in the morning and then continuing with a more formal interview back at the Hirshhorn conservation studio. The interview team was top-notch: Steven and chief conservator Susan Lake were the interviewers, collections assistant Nick Kaplan ran audio, and staff photographer Cathy Carver and conservation intern Caitlin Richeson were the videographers. I took supplemental photos and ran a back-up video-audio recording, and, along with everyone else, helped bus equipment. 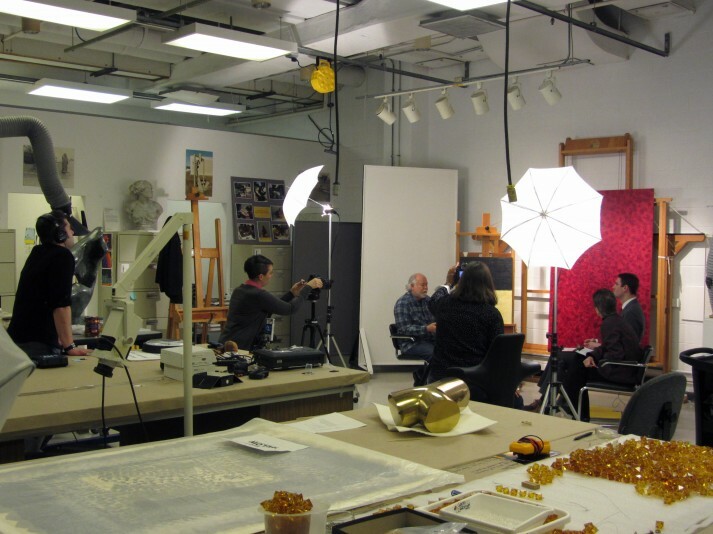 The interview set up in the Hirshhorn conservation studio. From left: Nick Kaplan, Caitlin Richeson, Robin Rose, Cathy Carver, Susan Lake, and Steven O’Banion. Mr. Rose is mostly known for his encaustic works, although he now uses acrylic paint during the winter months. The cheerful and well-spoken artist is also a musician, and not only are his paintings conceptually tied to sound, but his studio is literally surrounded by an incredible collection of records, mid-century turn tables and sound boards, and guitars. The morning session allowed Mr. Rose to discuss his carefully thought-out technique and material choices, whereas the afternoon was geared towards specific artworks and goals of preservation. Steven had prepared an outline of priority questions that he and Susan used as personal checklists, not as a script. This helped keep the conversation both natural and productive. The full interview transcript and all digital files have been archived, and seven clips of the interview are now available for your viewing pleasure. I strongly encourage others to seek similar opportunities to assist or shadow an established interview program such as the Hirshhorn’s. While most interviews may not have as much institutional support or be as well-produced, participating in a “best practice” scenario provides a standard for comparison in the future. Witnessing the process firsthand and getting to handle the equipment goes a long way towards increasing confidence; familiarity with the environment of an interview helps an interviewer focus on the artist. Tips given during the VoCA workshop were put into practice here, demonstrating the effectiveness of details such as high quality sound and appropriate camera angles, and keeping an interviewee on topic while encouraging his voice. By far, the most beneficial aspect to observe was the shared knowledge and goals within the Hirshhorn team that manifest preparation into action. This gave a sense of focus to a conversation that could have gone in any direction. As I wrap up my student career and look ahead to professional life, I am immensely grateful to have had the chance to learn from the best through involvement in the VoCA workshop and the Hirshhorn’s interview program. While I may not be cured of my tendency to talk to paintings, I feel more confident about moving forward with a proactive and productive approach to this vital aspect of preserving contemporary art.